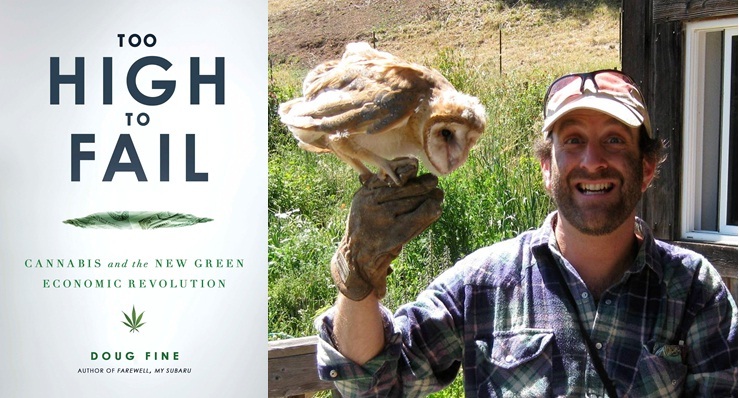 Jeff Glor talks to Doug Fine about "Too High to Fail: Cannabis and the New Green Economic Revolution"
Doug Fine: I got started on the project because the mayor of a nearby village to my ranch (this a U.S. town) was convicted of being a Cartel member and smuggling weapons. It was just too close to home. I saw how even well-intentioned law enforcement in my border region of New Mexico can't possibly make a dent in supply and demand. I had to see of there was a working alternative to the Drug War which I could examine as a potential model. Recent polls have 56 percent of Americans ready to end the Drug War, which is one of our nation's worst policies for reasons documented at length in the book and not a surprise to most of us. This book aims to paint the picture of why a Drug Peace that I witnessed would mean a better America, from an economic and patriotic standpoint. I'm trying to let those remaining 44 percent know that this is a top-tier important issue for our economy and our national health. To illustrate that, I relocated to Mendocino County's and for one cannabis growing season (10 months) covered the county's successful efforts to permit sustainable cannabis farmers. I followed one flower, named Lucille for reasons that have to do with the neighbor of a farmer I followed, from farm to liver cancer battler. DF: The kind of thing that surprises me is that there was a Big Bang, or that the Earth has an atmosphere at all. Or that "This is Spinal Tap" didn't win an Academy Award. Not much surprised me about the quantitative results of my research into the coming Drug Peace. The old lady rancher across the valley from me knows the Drug War is one of a great nation's worst policies. Pat Robertson knows. Maybe I was a little surprised by just how valuable the cannabis plant can be to the American economy -- $6 billion annually just in the county I researched in the book. DF: Does not compute. Not an option. OK, if forced, um, professional river innertuber. DF: Re-reading "The River Why" by David James Duncan. DF: Goat milking. In about five minutes. Work wise, looking back in 10 years I'd like to have one or two novels, one or two nonfiction books, one or two feature films, one or two documentary films, and a children's book under my belt. Maybe even a small volume of poetry. And I'd like to have a hot tub. For more on "Too High to Fail," visit the Penguin Group website.